Hinge patterns in the hip joint are important for everyone but especially important for your athletes participating in contact sports. In order to stabilize and receive a check or hit, you need to be able to absorb the force in your hips to protect your back. This sequence will help you open up stiff joints and strengthen supporting structures crucial for contact. 1) Decompress: 90/90 Breathing with internal hip rotation. bend you hips and knees at 90 degrees, placing your bare feet on the wall. lay flat on your back, creating space at the back of your neck. place a yoga block or prop between your knees and press in about 25lbs of pressure to anchor your pelvis with an active adductor muscle group. breathe tall and wide creating space between your pelvis and ribcage 360 degrees around. with each inhale grow taller and wider, with each exhale engage core muscles and pull abdomen in. avoid flaring ribs or arching lumbar spine. 2) Lengthen: Quadruped Rock Back with leg abducted. get yourself into a quadruped position, hands slightly wider than shoulder width apart and knees slightly wider than hip width apart. find neutral spine position & dorsiflex ankles. ABduct on leg out to the side and rock back your weight into your heels. 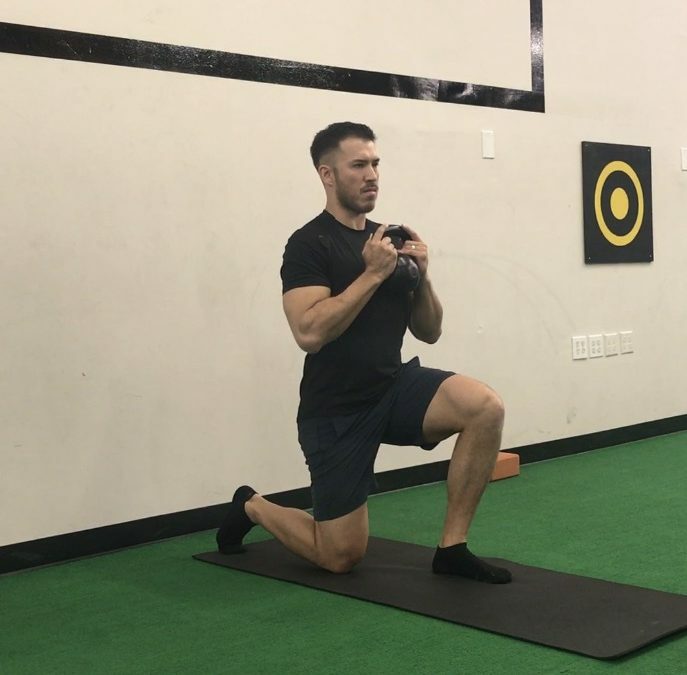 find the active range where you can maintain neutral spine position as you rock back and then press about 25lbs of pressure with your ABducted leg into the floor to find that isometric engagement of the adductor muscle group. hold the isometric stretch for 5-7 seconds, and relax to find a lengthened adductor muscle group working yourself into a deeper rock back. repeat 4 reps per leg. relax supine with about a 90 degree bend in your knees, find neutral spine. bend resting leg into abdomen and add a lacrosse ball above the hip flexor to force isolation of the opposite, working leg. with the working leg activate gluteal muscle and thrust hip up into hip extension. maintain neutral lumbar position during the movement. 4 reps per leg and switch sides. grab a medium top light weight kettlebell. place feet slightly wider than hip width apart. step backwards with one leg into a reverse lunge. knee should be bent to 90 degrees at end position, don’t step too shallow where knee tracks way over toes or too deep where knee angle increases above 90 degrees. alternate 4 reps per side.